The nation’s #1 real estate broker and star of Bravo’s Million Dollar Listing New York shares his secrets for superstar success and getting what you want out of life—no matter who you are or what you do.Ten years ago, Fredrik Eklund moved to New York City from his native Sweden with nothing but a pair of worn-out sneakers and a dream: to make it big in the city that never sleeps. Since then, he’s become the top seller in the most competitive real estate market on the planet, brokering multimillion-dollar deals for celebrities, selling out properties all over the city, and charming audiences around the world as one of the stars of the hit Bravo series Million Dollar Listing New York.Now, for the first time, Fredrik shares his secrets so that anyone can find success doing what they love. 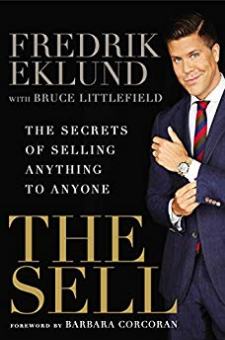 According to Fredrik, even if you don’t consider yourself a salesperson, you’ve been in sales your whole life because every day you are selling your most important asset: yourself. Whenever you influence, persuade or convince someone to give you something in exchange for what you’ve got—whether it’s a luxury home, a great idea at work, or your profile on Match.com—you are selling. And if you know how to sell the right way, you can live your dream. That is what The Sell is all about. Blending personal stories, hilarious anecdotes, and the expertise he’s gained from his meteoric rise, Fredrik has written the modern guide on becoming successful, a book that tells you how to recognize and cultivate your true talents and make the ultimate sell. From the importance of being your most authentic self to looking like a million bucks even if you don’t have a million bucks (yet! ), he shows how intangible factors like personality and charm can get you noticed and make you shine. He also shares his tips and tricks for preparing, persuading, and negotiating so that in any of life’s dealings, you’ll come out a winner. Whether you work on Wall Street or at Wal-Mart, aim to become the top seller at your company or want to impress a first date, The Sell will help you have more personal and professional success, lead a rich and fulfilling life, and have fun along the way. From the Hardcover edition.